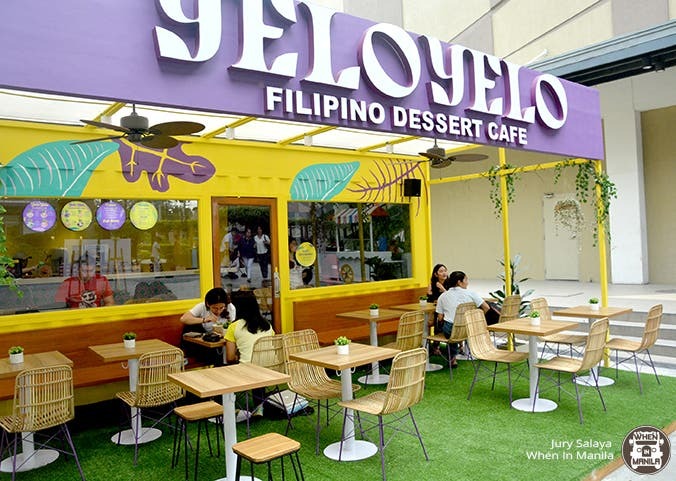 LOOK: This Filipino Dessert Café Gives a Unique Twist on Classic Pinoy Favorites And They Are Good For Sharing at P169! The post LOOK: This Filipino Dessert Café Gives a Unique Twist on Classic Pinoy Favorites And They Are Good For Sharing at P169! appeared first on When In Manila. “What time is it? Summer time. It’s our vacation!” – High School Musical sang the perfect line to welcome the season of sun, palm, fruits, and fun. That’s right! Summer is almost here, and it is hotter than ever–like, literally. Stepping out of the house and onto the busy streets of Manila under the scorching March sun is a challenge we are being forced to conquer. The clothes you carefully picked out are drenched in seconds, even if you thought they would keep you looking fresh throughout the day. We are finally in that period of anticipation when until the weeks of our approved vacation leave, we are stuck in a daydream of being by the beach, with coconut trees standing tall overhead, fine white sand under our soles, and salt in our hair, as we feast on grilled seafood deliciously laid out on a bed of onions and tomatoes on huge banana leaves, and a bowl of halo-halo to top it all off! 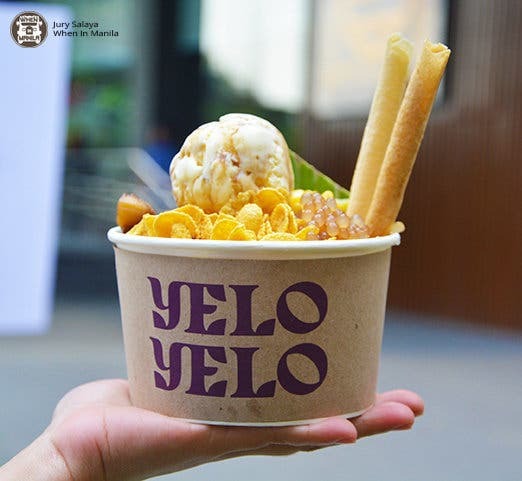 Thankfully, before we get to that much-awaited time of the year, we can experience summer and the desserts that come with it right here and now at this newly-opened dessert café. 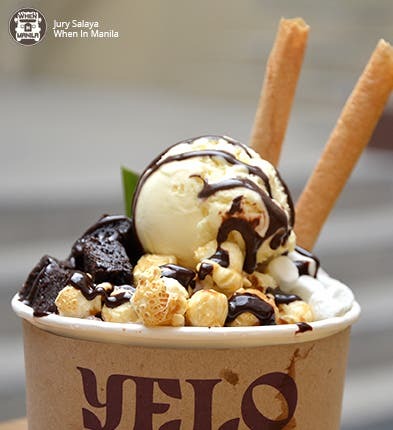 Yelo Yelo is a dessert concept store, which opened last February, conveniently situated at a beautiful sunny spot on a lush green patch of grass within the walls of UP Town Center. Its purple and yellow exterior design make the miniature store look like it was pulled straight out of its own little town. 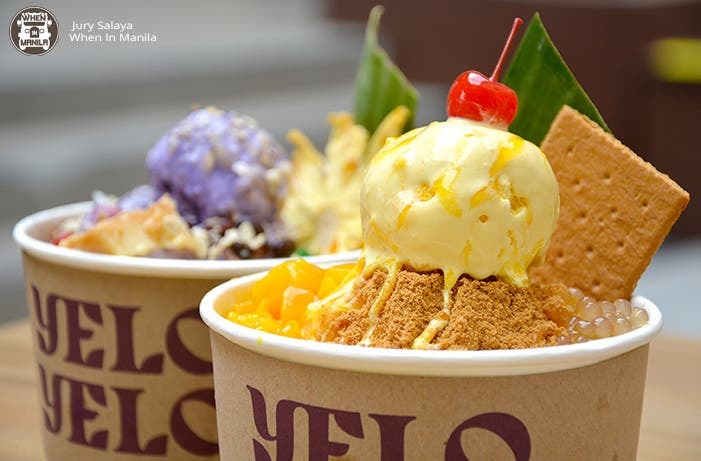 Their curated menu features Filipino favorites, such as buko juice, turon, and of course, halo-halo. Not to mention the best part, they use native ingredients acquired fresh from their origins or the cities known for producing them in good quality. All within the price range of P79 to P169; no more, no less! And they are good for sharing! 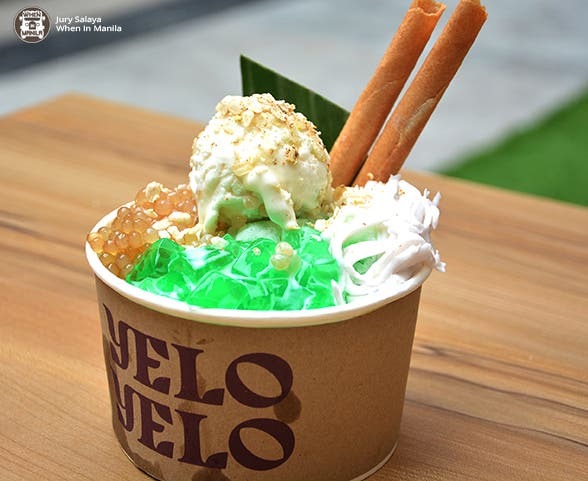 The café has created their own twists to some famous merienda and summer coolers, such as the buko pandan topped with macapuno ice cream, saba con hielo mixed with corn, mango float drizzled with caramel latik, butterscotch bars on cheese ice cream, and mango and Batangas suman on ice! Are you drooling yet? 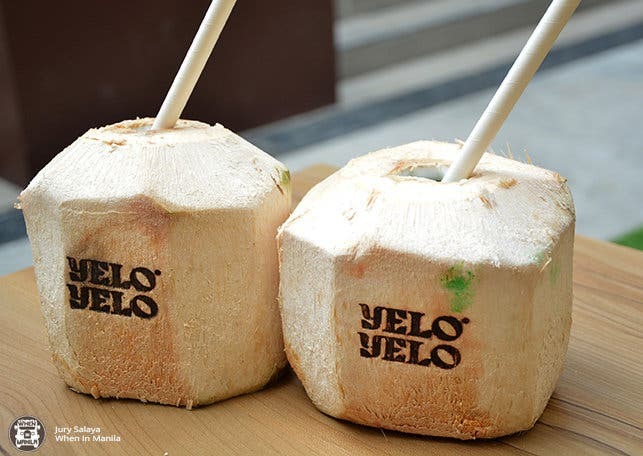 Now, Halo-halo and Buko Pandan may be, unsurprisingly, their bestsellers, but the Say Keso and Choco Pop definitely deserve some recognition, too. And I will tell you why: you know when something smells so familiar, or a food tastes so good, it seems to slap you right across the face at the moment of contact? That is exactly what the homemade brownie toppings on the Choco Pop did to me as soon as I had my first scoop. That chocolate-y goodness caught me off guard. It was heavenly. Well, if this does not convince you, just know that it also has caramel popcorn, marshmallow, and vanilla ice cream. I’m not even kidding! For the Say Keso, however, I only have three words: butterscotch, cheese, and muscovado. Need I say more? 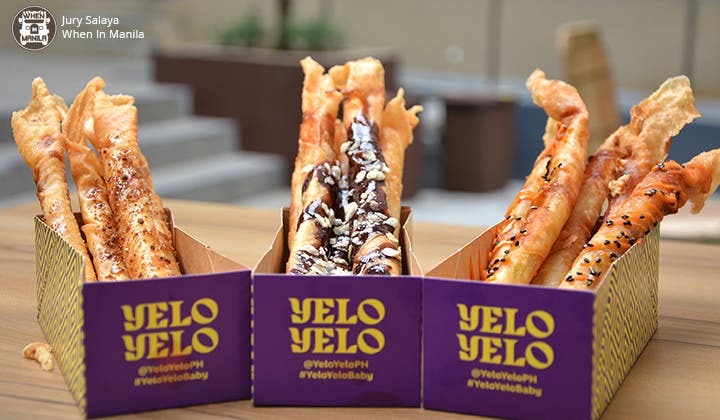 Getting to the hot stuff, they also offer four turon variations: Banana Langka drizzled with Davao Chocolate, Suman Mangga with caramel, Muscovado Cheese with Palawan Honey, and Dynamite Cheese with Spicy Mayo. While all these are super enjoyable treats, the Dynamite Cheese has such a unique flavor, it is a must-try. Hot drinks such as coffee from Benguet and chocolate from Davao are also available. If everything sounds too good and you can’t choose, you can always start with the Caramel Latik Latte which is thick, creamy, and has a distinct flavor–it’s like native delicacies in a cup! Want to know the cherry on top of all these sweets? This café is not only true and consistent on their support for local, they also promote the plastic-free lifestyle by using wooden spoons, paper straws, and paper cups. I can go on and on for hours enumerating everything nice about this new hangout spot, but the only way to truly know is to try! 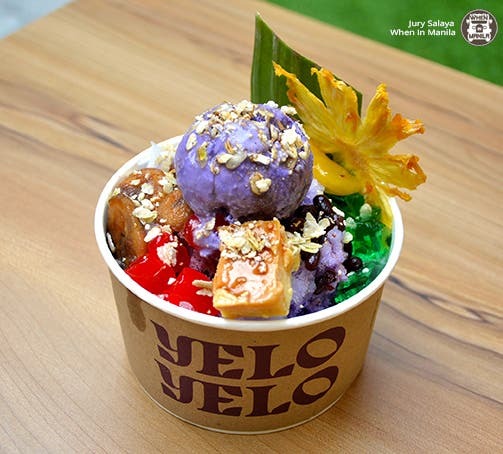 What is your favorite Filipino dessert? Tell us in the comments!